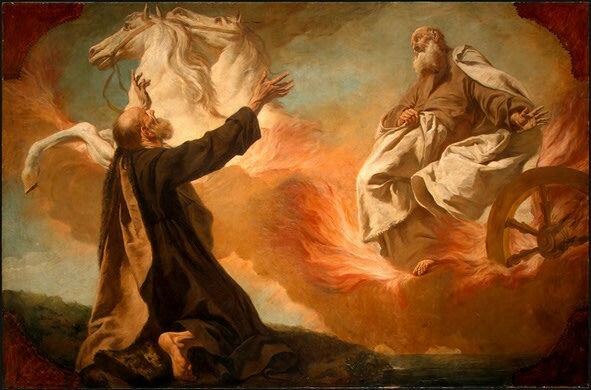 Elijah, revered as the spiritual Father and traditional founder of the Order of Carmelites, was a prophet and a wonder-worker in the northern kingdom of Israel during the reign of Ahab during the 9th century B.C. According to the Books of Kings in the Old Testament, Elijah defended the worship of Yahweh over that of the Canaanite idol Baal. He also had God perform miracles for him, which included raising the dead, bringing fire down from the sky, and having himself be taken up "by a whirlwind". In the Book of Malachi, Elijah's return is prophesied "before the coming of the great and terrible day of the Lord," making him a harbinger of both the Messiah and the end of the world. References to Elijah appear in the New Testament, the Talmud, the Mishnah, and the Qur'an. In addition to taking their name from Mt. Carmel, where the first hermits of the order established themselves, the Calced Carmelite and Discalced Carmelite traditions pertaining to Elijah focus upon the prophet’s withdrawal from public life. The medieval Carmelite Book of the First Monks offers some insight into the heart of the Orders' contemplative vocation and reverence for the prophet. In Judaism, Elijah's name is invoked at the weekly Havdalah ritual that marks the end of Shabbat, and Elijah is invoked in other Jewish customs, among them the Passover seder and the Brit milah (ritual circumcision). At the circumcision ceremonies, a chair is set aside for the use of Elijah. This custom stems from the incident at Mount Horeb (1 Kings 19): Elijah had arrived at Mount Horeb after the demonstration of God's presence and power on Mount Carmel (1 Kings 18). God asked Elijah to explain his arrival, and Elijah replied: “I have been very jealous for the Lord, the God of hosts; for the people of Israel have forsaken thy covenant, thrown down thy altars, and slain thy prophets with the sword; and only I am left—and they seek to take my life” (1 Kings 19:10). The thinking goes that since Elijah accused Israel of failing to uphold the covenant, God would require Elijah to be present at every covenant of circumcision. The New Testament describes how both Jesus and John the Baptist are compared to Elijah and, on some occasions, thought by some to be manifestations of Elijah. In the Qur'an and certain Islamic traditions, Elijah is described as a great and righteous man of God and one who powerfully preached against the worship of Baal. By the 9th century BC, the Kingdom of Israel, once united under King Solomon, was divided into the northern Kingdom of Israel and the southern Kingdom of Judah, which retained the historic seat of government at the Temple in Jerusalem. Omri, King of Israel, continued policies dating from the reign of Jeroboam, contrary to the laws of Moses, which were intended to reorient religious focus away from Jerusalem: encouraging the building of local temple altars for sacrifices, appointing priests from outside the family of the Levites, and allowing or encouraging temples dedicated to the Canaanite god, Baal. Omri achieved domestic security with a marriage alliance between his son Ahab and the Princess Jezebel, a priestess of Baal and the daughter of the king of Sidon in Phoenicia. These solutions brought security and economic prosperity to Israel for a time, but did not bring peace with the Israelite prophets, who were interested in a strict Deuteronomic interpretation of Mosaic law. Under Ahab's kingship, these tensions were exacerbated. Ahab built a temple for Baal, and his wife Jezebel brought a large entourage of priests and prophets of Baal and Asherah into the country. It is in this context that Elijah is introduced in 1 Kings 17:1 as “Elijah the Tishbite". He warned Ahab that there would be years of catastrophic drought so severe that not even dew would fall, because Ahab and his queen stood at the end of a line of kings of Israel who were said to have "done evil in the sight of the Lord" (1st and 2nd Kings). As told in the Old Testament, Elijah's challenge is bold and direct. Baal was the Canaanite god thought to be responsible for rain, thunder, lightning, and dew. Elijah not only challenged Baal on behalf of his own God, Yahweh, but he also challenged Jezebel, her priests, Ahab, and the people of Israel. After Elijah's confrontation with Ahab, God told him to flee out of Israel to a hiding place by the brook Chorath, east of the Jordan, where he would be fed by ravens. When the brook dried up, God sent him to a widow living in the town of Zarephatho in Phoenicia. When Elijah found her and asked to be fed, she said that she did not have sufficient food to keep her and her own son alive. Elijah told her that God would not allow her supply of flour or oil to run out, saying, "Don't be afraid. This is what the Lord, the God of Israel, says: 'The jar of flour will not be used up and the jug of oil will not run dry until the day the Lord gives rain on the land.' " She then fed him the last of their food, and Elijah's promise miraculously came true. Thus, by an act of faith the woman received "manna" from Heaven even while He was withholding food from His unfaithful people in the promised land. Sometime later, the widow's son died and the widow cried out, "Did you come to remind me of my sin and kill my son?" Moved by a faith like that of Abraham (Romans 4:17, Hebrews 11:19), Elijah prayed that God might restore her son so that the veracity and trustworthiness of God's word might be demonstrated. In 1 Kings 17:22, we read how God "heard the voice of Elijah; and the soul of the child came into him again, and he was revived." This is the first instance of raising the dead recorded in Scripture. This non-Israelite widow was granted the best covenant blessing in the person of her son, the only hope for a widow in ancient society. The widow cried out, "...the word of the Lord from your mouth is the truth," thus making a confession that the Israelites had failed to make. After more than three years of drought and famine, God told Elijah to return to Ahab and announce the end of the drought. While on his way, Elijah met Obadiah, the head of Ahab's household, who had hidden a hundred prophets of the God of Israel when Ahab and Jezebel had been killing them. Elijah sent Obadiah back to Ahab to announce his return to Israel. When Ahab confronted Elijah, he referred to him as the "troubler of Israel." Elijah responded by throwing the charge back at Ahab, saying that it was Ahab who troubled Israel by allowing the worship of false gods. Elijah then berated both the people of Israel and Ahab for their acquiescence in Baal worship. “How long will you go limping with two different opinions? If the Lord is God, follow Him; but if Baal, then follow him” (1 Kings 18:21). And the people were silent. The Hebrew for the words "go limping" or "waver” is the same as that used for "danced" in Verse 26, where the prophets of Baal frantically danced. Elijah spoke with sharp irony; in the religious ambivalence of Israel, he is portrayed here as engaging in a wild and futile religious "dance". At this point Elijah proposed a direct test of the powers of Baal and Yahweh. The people of Israel, 450 prophets of Baal, and 400 prophets of Asherahwere summoned to Mount Carmel. Two altars were built, one for Baal and one for Yahweh. Wood was laid on the altars, and two slaughtered oxen were cut into pieces and laid on the wood. Elijah then invited the priests of Baal to pray for fire to light the sacrifice. They prayed from morning to noon without success, and Elijah ridiculed their efforts. They responded by cutting themselves and adding their own blood to the sacrifice (such mutilation of the body was strictly forbidden in the Mosaic law). They continued praying until evening without success. Elijah then ordered that the altar of Yahweh be drenched with water from "four large jars" poured three times (1 Kings 18:33–34). He asked God to accept the sacrifice, and fire fell from the sky, consuming the water, the sacrifice, and the stones of the altar itself. At that point, Elijah ordered the deaths of the prophets of Baal and prayed earnestly for rain to fall again on the land. Then the rains began, signaling the end of the famine. Jezebel, enraged that Elijah had ordered the deaths of her priests, threatened to kill Elijah (1 Kings 19:1–13). Later Elijah prophesied about Jezebel's death because of her sin and then fled to Beersheba in Judah, continuing alone into the wilderness, where he sat down under a shrub and prayed for death. He then fell asleep under a tree until an angel of the Lord touched him and told him to wake up and eat. When he awoke, he found bread and a jar of water, which he consumed before going back to sleep. The angel came a second time and told him to again eat and drink because he had a long journey ahead of him. Elijah traveled for forty days and forty nights to Mount Horeb, where Moses had received the Ten Commandments. Elijah is the only person described in the Bible as returning to Horeb after Moses and his generation had left there several centuries before. He sought shelter in a cave, where God again spoke to him (1 Kings 19:9): "Why are you here, Elijah?" Elijah did not give a direct answer to the Lord's question but evaded and equivocated, implying that the work the Lord had begun centuries earlier had now come to nothing, and that his own work was fruitless. Unlike Moses, who tried to defend Israel when they sinned with the golden calf, Elijah bitterly complained over the Israelites' unfaithfulness and said that he was the "only one left." Up until that time, Elijah had only the Word of God to guide him, but was now told to go outside the cave and "stand before the Lord." A terrible wind passed, but God was not in the wind. A great earthquake shook the mountain, but God was not in the earthquake. Then a fire passed the mountain, but God was not in the fire. Then a "still small voice" came to Elijah and asked again, "Why are you here, Elijah?" Elijah again evaded the question, showing that he did not understand the importance of the divine revelation he had just witnessed. God then sent him out again, this time to Damascus to anoint Hazael as King of Syria, Jehu as King of Israel, and Elisha as his replacement. Elijah encountered Ahab again in 1 Kings 21, after Ahab has acquired possession of a vineyard by murder. Ahab desired to have the vineyard of Naboth of Jezreel. He offered a better vineyard or a fair price for the land. But Naboth told Ahab that God told him not to part with the land. Ahab accepted this answer with sullen bad grace. Jezebel, however, plotted a method for acquiring the land. She sent letters, in Ahab's name, to the elders and nobles who lived near Naboth, saying they were to arrange a feast and invite Naboth; at the feast, false charges of cursing God and Ahab were to be made against him. The plot was carried out, and Naboth was stoned to death. When word came that Naboth was dead, Jezebel told Ahab to take possession of the vineyard. God again spoke to Elijah and sent him to confront Ahab with a question and a prophecy: "Have you killed and also taken possession?" and "In the place where dogs licked up the blood of Naboth, shall dogs lick up your own blood?" (1 Kings 21:19). Ahab responded by calling Elijah his enemy. Elijah countered by throwing the charge back at him, telling him that he made himself the enemy of God by his own actions. Elijah then went beyond the prophecy he was given and told Ahab that his entire kingdom would reject his authority; that Jezebel and his entire family would be eaten by dogs (if they die in a city) or by birds (if they die in the country). When Ahab heard this, he repented to such a degree that God relented in punishing him—although he still punished Jezebel and their son, Ahaziah. Elijah then encountered Ahaziah, who was seriously injured in a fall and had sent for the priests of Baalzebub in Ekron to find out if he would recover. Elijah intercepted his messengers and sent them back to Ahaziah with a question: "Is it because there is no God in Israel that you are inquiring of Baalzebub, the god of Ekron? "(2 Kings 1:6). Ahaziah asked the messengers to describe the person who gave them this message, and they told him that he wore a hairy coat with a leather belt. Ahaziah instantly recognized this description as being that of Elijah the Tishbite. Ahaziah then sent out three groups of soldiers to arrest Elijah. The first two were destroyed by fire, which Elijah called down from heaven. The leader of the third group asked for mercy for himself and his men. Elijah agreed to accompany this third group to Ahaziah, where he gave his prophecy in person. Elijah, in company with Elisha (Eliseus), approached the Jordan, rolled up his mantle, and struck the water (2 Kings 2:8). The water immediately divided and Elijah and Elisha crossed on dry land. Suddenly, a chariot of fire and horses appeared, and Elijah was lifted up in a whirlwind. As Elijah was lifted up, his mantle fell to the ground and Elisha picked it up.In spite of Elijah's many miracles, the mass of the Jewish people remained as godless as before. They even abolished the sign of the covenant, and the prophet had to appear as Israel's accuser before God. In the New Testament, Jesus would say, for those who believed, that John the Baptist was Elijah,the one who would come before the "great and terrible day," as predicted by Malachi. John the Baptist preached a message of repentance and baptism and predicted the day of judgment using imagery similar to that of Malachi. He also preached that the Messiah was coming. All of this was done in a style that immediately recalled the image of Elijah to his audience. He wore a coat of camel's hair secured with a leather girdle (Matthew 3:4, Mark 1:6) and frequently preached in wilderness areas near the Jordan River. In the Gospel of John, when John the Baptist was asked by a delegation of priests, "Art thou Elias?,” he replied "I am not" (John 1:21). Both Matthew 11:14 and Matthew 17:10–13, however, make it clear that John was the spiritual successor to Elijah. In the nativity story of St. John the Baptist in the Gospel of Luke, the Angel Gabriel appeared to Zechariah, John's father, and told him that John "will turn many of the sons of Israel to the Lord their God," and that he will go forth "in the spirit and power of Elijah" (Luke 1:16–17). In the Gospel of Luke, Herod Antipas hears some of the stories surrounding Jesus Christ. Some tell Herod that Jesus is John the Baptist (whom Herod had executed) come back to life. Others tell him that Jesus is Elijah. Later in the same Gospel, Jesus asked His disciples who the people were saying that He was. The apostles' answers included, among others,the Prophet Elijah. However, Jesus' ministry had little in common with that of Elijah; in particular, He preached the forgiveness of one's enemies, while Elijah killed his. However, miracle stories similar to those of Elijah were associated with Jesus (e.g., raising the dead and miraculous feedings). Jesus implicitly separated Himself from Elijah when He rebuked James and John for desiring to call down fire upon an unwelcoming Samaritan village in a similar manner to Elijah. Likewise, Jesus rebuked a potential follower who wanted first to return home to say farewell to his family, whereas Elijah permitted this of his replacement Elisha. During Jesus' crucifixion, some of the onlookers wondered if Elijah would come to rescue Him, as Elijah had entered folklore as a rescuer of Jews in distress. At the summit of Mount Tabor during the miracle of the Transfiguration, Jesus' face began to shine; and the disciples who were with Him heard the voice of God announce that “this is My beloved Son…" The disciples then saw Moses and Elijah appear and talk with Jesus, causing Peter to be so struck by the experience that he asked Jesus if they should build three "tabernacles,” one for Elijah, one for Jesus, and one for Moses. There is agreement among many Christian theologians that Elijah appeared as a witness of the prophets; and Moses, as a witness of the law. Elijah is mentioned three more times in the New Testament: in Luke, Romans, and James. In Luke 4:24–27, Jesus used Elijah as an example of rejected prophets, saying, "No prophet is accepted in his own country," and then mentioned Elijah, saying that there were many widows in Israel, but Elijah was sent to one in Phoenicia. In Romans 11:1–6, Paul cited Elijah as an example of God never forsaking His people (the Israelites). In James 5:16–18, "The effectual, fervent prayer of a righteous man availeth much," is cited as an example of Elijah's prayers, which started and ended the famine in Israel. ABOVE: Painting of Elijah and Mary: An ancient Carmelite interpretation of the cloud of pure rain that Elijah saw rising from the salty sea (1 Kings 18:44) is that it prefigured Mary who was born immaculate. 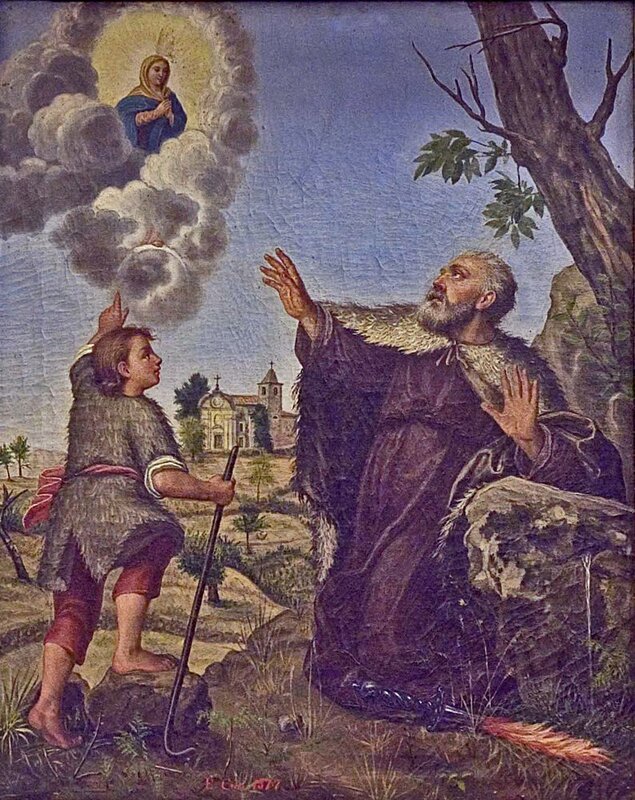 This painting of the episode, depicting Elijah in the Carmelite habit, is in Saint Albert's International Center in Rome.